Home » News & Blogs » REconomy LIFT – what happens when we come together to transform local economies. On 25th February over 70 people gathered at the Cinema Museum in London for REconomy LIFT – an event for Transition groups across London and the South East. Designed with the aim to inspire and enable people to transform their local economies from the roots up, there was a unique energy in the room right from the start. Andrew Simms from the New Weather Institute kicked things off with a rallying and thought provoking introduction. Hear him speak. It was clear from the day’s packed agenda that Andrew is right. The first session of the day consisted of seven workshops run by contributors from across the region already testing out these ‘better ways’ for themselves and ready to share their experiences. It was a difficult choice between community energy, food markets and veg boxes, local economic blueprints and forums, REconomy in practice and community property ownership. Read the full list of workshops. The differences and diversity in passions and goals were reflected once again in the afternoon skills sessions – six break out groups fueled on the energy from an abundant shared offering of cakes and local goodies. Whether you forte was fundraising, communication or legal structures, there was something for everyone. You can find the resources covered in the sessions listed in our online document. And 92% made new contacts relevant to local economy activities. To give this some context we asked three people to share their thoughts with you – about the connections they made, their intentions from the day and how they plan to keep up the infections momentum from REconomy LIFT! Michael who came to REconomy LIFT as a newcomer to Transition. Karen from Crystal Palace Food Market. Karen led a workshop at the event. Tell us what an event like REconomy LIFT brings or adds to your current Transition Network (TN) activities? Michael: Currently I don’t have any TN activities. This is the first time I came to an event like this and it was really great. I was by myself but was instantly welcomed by the group and felt comfortable sharing my thoughts with everyone else. I would now be very keen to join future events like this. Karen: It’s really great to connect with other people who have a similar vision, it brings a sense of being part of a community. Richard: REconomy LIFT brings connection. Connection between Transition Initiatives who are regional neighbours. Connections between stories and themes; between geographical proximity; between this region and a wider Transition Movement. For me, seeing that connection happen offered the opportunity to share experiences and stories and through that sharing, perhaps circumvent reinventing the wheel. It provided an opportunity to support individual and group projects by seeding possibilities for ongoing relationships, providing a generous and caring place for those brave enough to suggest new ideas that often feel a bit terrifying and give a huge amount of resources for post event activities. Did you make new connections? Tell us about them. Michael: The two facilitators of the group had previous experience in creating energy projects and were very informative. I also met other people my age who were interested in renewable energy which was exciting as I hadn’t considered this! One of them created a Facebook group called “People Interested in REconomy Renewable Energy”, which I was keen to join and we will hopefully be able to motivate and learn off each other. Karen: I deepened my relationship with Jane Langley from Blue Patch and met Preeti Bonton to talk about business planning. I met and talked to Jo Taylor. Richard: Wow, where do I start – through the process of Co-Producing the event, I’ve developed richer relationships with lots of people from the REconomy Project and Transition Network, plus across the Transition London and South East Hub. Not forgetting our fantastic contributors and helpers on the day and a big chunk of the Transition Initiatives who attended. Specifically, the London and South East Hub development, I think, has been given a big dose of energy and focus and an embodied and activated sense of purpose through making REconomy LIFT happen. Transition is all about the activity, but to support that activity and give a sense of a greater whole we need to do events like REconomy LIFT. Tangible ongoing connections are its the Transition Initiatives in London and the South East, we have our next meet up on Monday 13th March, as well as with the TN and REconomy Project for future Regional gatherings. Were there any people or activities that you feel would have added to the conversation? Michael: I think the conversations were very good. They showed what everyone was interested in and what they were doing. Smaller groups would have been helpful as this would have encourage more discussion. Our group was quite big, and after everyone introduced themselves we ran out of time to get into deep conversation and question answering. Karen: I would have liked more time for each of the activities. It felt a bit rushed in the time we had. Richard: I feel we did as much as we could in the resources at our disposal, however, I would have liked to have seen a greater diversity of attendees from other Grassroots Environmental Organisations and movements and the wider actors who support Social and Technical innovations like Transition Towns, e.g. local Government officers and representatives, Institutional representatives perhaps from education etc. I would have loved to open out the Transition focus to them about a month out from the event and perhaps invited them as “keynote listeners” particular any Politicians. I believe creating more opportunity for overlap and cross-fertilisation of ideas would have been beneficial and positive. But the event was a delight! The energy and focus in the room was tangible and brilliant! What intention or action did you take from the day? Michael: I booked myself onto “Demand Energy Equality”, where I will learn how to build a solar panel. I had found the course online before the event, but had met someone at the event who helps run it! I also intend to go to similar events in the future and when I get a chance to commit to local project. Karen: To continue to run the market and improve it every week. To keep an eye out for the projects that were presented at the event. 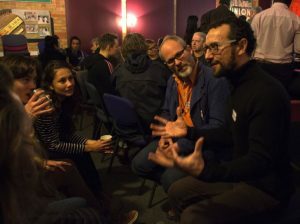 Richard: To keep connecting people and groups in the spirit of the London and SE Hub – sharing experiences, supporting people and groups and projects, organising together to affect greater change and be part of a bigger picture of grassroots innovation. Keeping opportunities open for celebration and connecting beyond Transition to create more possibilities. What follow up would you plan after this event to keep up the momentum and energy? Michael: I find that I want to do something positive but find that I am short on time. Another event like this would be great as it re-connects me with my values of working together to make a greener better world from the ground up, but equally a local event where I can turn up and do some work to move a project forward would be exactly what I want to do. Karen: To recommend that others attend Transition events in London and the South East – it’s so good to feel part of something bigger than just your area.